While roaming, ReachMe users can receive incoming phone calls over data, for free. BARCELONA, Spain, Feb. 26, 2018 /PRNewswire/ -- Mobile World Congress -- Kirusa, a global leader in communication solutions over data networks for consumers and enterprises, today announced the launch of InstaVoice ReachMe. 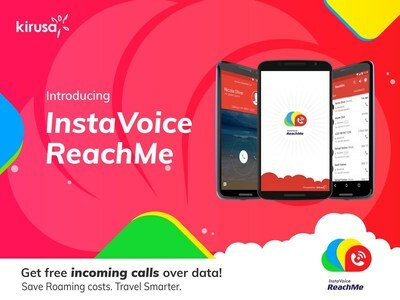 InstaVoice ReachMe is a new-generation app that leverages voice over data technologies to allow users to receive calls to their mobile numbers from inside the app, over data. The InstaVoice ReachMe App provides a unique telephony experience for users, converting incoming phone calls to their own existing mobile numbers into Voice over Internet Protocol (VoIP) calls, allowing users to receive such calls within the app. The called party simply needs to have an active data connection to receive calls. Meanwhile, the caller experience is the same as when making a normal mobile call â€“ use the regular phone dialer, with no need to dial from an app, and no need for a data connection. At the time of launch, ReachMe supports getting calls to mobile numbers from most carriers in USA, UK, Spain, France, Germany, Ireland, Netherlands, Austria, Belgium, Luxembourg, South Africa, Portugal, Poland, Panama, Sweden and Switzerland. One of the significant use case scenario for InstaVoice ReachMe is roaming. Travelers can save big on roaming fees by using ReachMe when they travel. Incoming calls from friends in their home countries, can be received in the app, while connected to data. For example, an international traveler can put in a local SIM card in the phone, and still get calls to his home country number on the phone. Another use case is for users who have multiple SIM cards. They no longer have to carry multiple SIMs and phones, as all calls, to any of their mobile numbers, can be answered in the InstaVoice ReachMe app. The numbers are virtualized, and can be answered from the mobile app, even if the SIM card is not in the device. When ReachMe calls go unanswered, callers have the option to leave a voicemail, which is delivered to the user within the app. Speaking on the launch, Dr. Inderpal Singh Mumick, Founder and CEO, Kirusa said: "With the continuing growth of quality data networks, texting and calling are moving to apps, where both parties are required to have the app installed on their devices. However, over 80% of calls are still made from a mobile network using the phone dialer. ReachMe is a unique hybrid OTT experience that allows users to receive these calls within an app, over data; providing a bridge between the mobile carrier and IP worlds. "It has been a focus area for many GSMA members to reduce roaming charges for consumers, and the roaming costs for operators. InstaVoice ReachMe stands out for its clever telco integration to deliver calls over data networks, even while roaming, bringing the power of VoWiFi to all devices and all types of data networks. By partnering with telcos, InstaVoice ReachMe stands to improve the roaming industry," said Mohan Gyani, Former CEO of AT&T Wireless, and a BOD Advisory member of GSMA Ltd.
"The African market is the fastest growing mobile market worldwide. At the same time, roaming costs continue to be a major concern for consumers, as well as for mobile operators, and we need innovative solutions that make roaming convenient and affordable, and help further grow the African economy. ReachMe provides a way for operators to offer a solution that is customer friendly, reduces roaming payouts, and continues to monetize the calls made on the mobile networks," said Zunaid Bulbulia, CFO of Huge Group, and formerly Group Chief Operations Executive at MTN. ReachMe, which was first introduced as a feature in the InstaVoice app, received a phenomenal response, hence driving the thought behind the release and launch of a separate InstaVoice ReachMe App. InstaVoice ReachMe works with multiple devices, and multiple phone numbers, which can be from one or more carriers, and from the same or different countries. Carriers desiring to enable ReachMe for their subscribers can contact sales@kirusa.com.